I think it's time that we all reconsider the (probably false) dichotomy that it's easy to fall into, of committing to newer cards or to older cards. 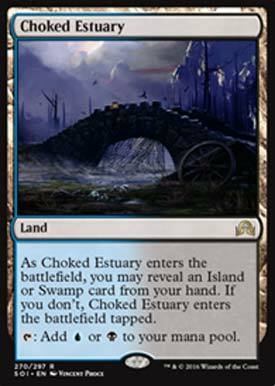 I like the original dual lands, I like recent variants on the original dual lands. I think these are an interesting variant of those variants: they seem to be intended to address the wrinkle with the M10-style dual lands where you couldn't use them on the first turn of the game. And I also like basic lands - I've been gradually expanding my collection of Unglued basic lands over the last year - so I like lands that try to make them relevant, though it's interesting that they still didn't change the template from the M10-style lands to specify basic lands. Obviously in Standard there is no difference, but in larger formats these can interact with Ravnica dual lands if you choose, and it's interesting to think that there are probably situations where each one would be a preferable first-turn play over the other.